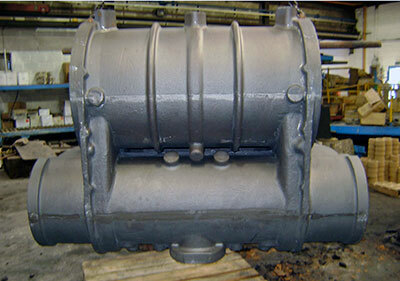 The first cylinder has been cast from the 82045 pattern by Cerdic Foundries Ltd. at their Chard foundry. This cylinder will be going to the North Yorkshire Moors Railway for fitting to 76079 which is currently out of traffic awaiting this vital component. 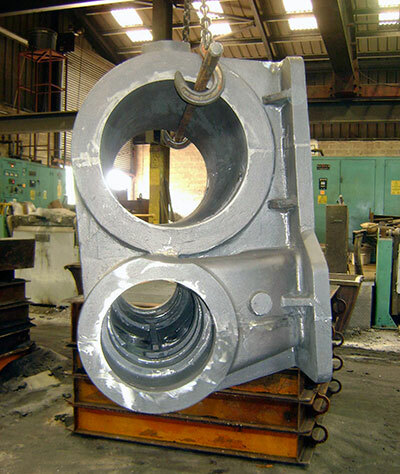 Once the machining of this cylinder has proved satisfactory the pair for 82045 will be cast. On the home front riveting of the front buffer beam has been completed and this draws to a close this particular aspect of the construction at the front end of the chassis. Attention will shortly turn towards the riveting assembly of the rear end of the chassis, a job which is expected to take some months to complete. Fitted bolts are now going into the horn blocks and horn guides. Machining of the spring brackets is underway and fabrication of the 'box' section which contains the rubber pads is about to commence. The pattern for the driving wheel axlebox is complete and we will be obtaining quotations for casting shortly. We were delighted with John Robinson's endorsement of 82045 in the latest issue of SVR News, and particularly with his inclusion of the loco in the Valley's steam fleet. "Robbo", as he is universally known, has spent years, as former Production Manager at Bridgnorth, at the sharp end of maintaining the SVR's steam fleet, and we greatly value his support. Thanks, John! Chris has completed the laborious exercise of calculating how much VAT we should be able to claim back now that we are registered for the tax. This, together with the Gift Aid we are due for 2012, amounts to an appreciable sum, one that should set us well on the way to financing the front and rear pony assemblies. More information as soon as we have some precise figures. We are amazed by the way the 82045 project has steadily gathered strength: especially in the past few months it seems to have acquired a life of its own, and certainly proves the old saying that the whole is greater than the sum of its parts. We are looking forward to launching the boiler appeal, in the second half of 2014 God willing. Thank you to all of you who are supporting the project - we'd be nowhere without you! The new cylinder cast for 76079 at the NYMR from the 82045 pattern. 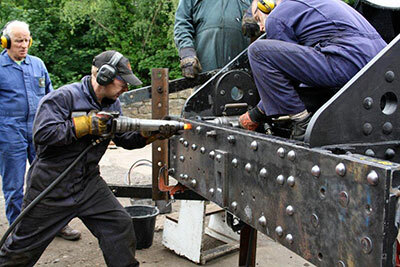 Photo: Steve Meech of Cerdic Foundries Ltd.
SVR boilersmith Ross Cooper riveting the front buffer beam. John Pagett operating the 'jammer', Bryan Clarke heating rivets, Martin Managhan cutting rivets to length and assisting to locate the 'jammer' on to the rivet head. Photo: Tony Massau. 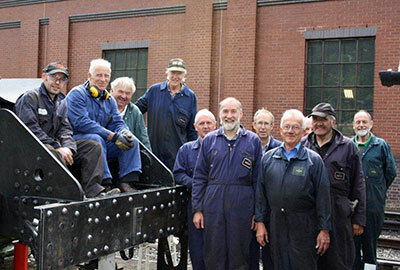 The engineering team upon completion of riveting the front buffer beam. Photo: Phil Denning.